An artist's illustration of the Swiss Space Systems SOAR rocket plane and its Airbus A300 mothership in flight. PARIS — A startup Swiss spaceflight company is planning to upgrade its proposed private satellite launch system into a manned suborbital space shuttle for science missions, the company announced Monday (June 17). The company Swiss Space Systems (S3) has no immediate plans to enter the space tourism market, but does see a market for low-cost microgravity research flights that may be more attractive to researchers than launching experiments on satellites or to the International Space Station, the company's founder and CEO Pascal Jaussi said. On Monday, the Payerne, Switzerland-based company unveiled an expansion of those space plane plans at the Paris Air Show here. The announcement included an agreement with veteran aerospace company Thales Alenia Space to begin work on a pressurized compartment on the SOAR shuttle to house experiments and crewmembers on future flights. "Thanks to this, we will be able to enhance our system by replacing the satellite cargo with a similarly developed pressurized module inside the SOAR, allowing S3 to perform microgravity research flights," Jaussi said. According to Jaussi, test flights of an unmanned version of the SOAR shuttle could begin by 2017, with the first commercial satellite launches to commence in 2018. Swiss Space Systems did not provide a timetable for manned missions, but officials said they were committed to the effort. 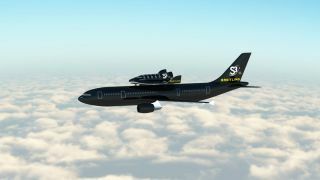 The SOAR concept calls for the rocket plane to ride piggyback atop an A300 jetliner to an altitude of about 33,000 feet (10,000 meters), then light a liquid-fueled engine to boost the craft higher than 50 miles, just shy of the internationally-recognized boundary of space. The traditional edge of space is an altitude of about 62 miles (100 km). A satellite would then deploy from SOAR's cargo pod and ignite its own rocket motor to reach Earth orbit. Swiss Space Systems claims SOAR can inject a 551-pound (250 kilograms) satellite into an orbit 434 miles (700 kilometers) above Earth. The company, which is sponsored by the Swiss watchmaker Breitling, has a budget of about $270 million, according to its website. Jaussi said Swiss Space Systems now has about 40 employees developing the SOAR space vehicle, support infrastructure and planning certification with European regulatory authorities. The memorandum of understanding with Thales covers the initial design of a cabin, which can be configured to carry research payloads or passengers, depending on the requirements of each flight. According to a Thales press statement, the two companies will negotiate a contract later this summer to finalize the agreement. Thales constructed pressurized modules for the International Space Station, including the Columbus laboratory and the Harmony and Tranquility connecting modules. The contractor's Italian business unit also builds cargo modules for Europe's Automated Transfer Vehicle and the Orbital Sciences Corp. Cygnus vehicles for space station resupply missions. This Swiss Space Systems graphic depicts the flight planned for the company's unmanned SOAR space plane for satellite launches. The spacecraft is designed to launch from an Airbus A300 jetliner. The SOAR design backed by Swiss Space Systems is one of a few European concepts aimed at serving the suborbital transportation market, but none of the European companies are as far along as U.S.-based Virgin Galactic, which completed the first rocket-powered flight of its SpaceShipTwo space plane in April. XCOR Aerospace, based at the same Mojave, Calif., airport as Virgin Galactic, hopes to begin test flights of its Lynx vehicle before the end of 2013, followed by commercial flights in 2014. Jaussi said Swiss Space Systems is working with the European Space Agency on computer modeling and trajectory analysis. SOAR traces much of its design heritage to Europe's Hermes program, a mini-shuttle scrapped by ESA in the early 1990s. ESA has not provided any funding to the SOAR project and has not signed up to be a customer. Company officials have participated in working groups with the European Aviation Safety Agency, a pan-European regulatory agency which monitors compliance with safety rules, Jaussi said. Swiss Space Systems hopes technology for the SOAR vehicle will revolutionize point-to-point travel, allowing intercontinental flights to race around the globe at three times the speed of sound. The firm has signed an agreement to potentially operate from a spaceport in Malaysia, and "advanced discussions" are underway with sites in Morocco, Canada and Ecuador, Jaussi said. "Far from wishing to launch into the space tourism market, we want rather to establish a new mode of air travel based on our satellite launch model that will allow spaceports on different continents to be reached in an hour," Jaussi said in a statement.